DuPont (DD) supplies high-performance materials and chemicals, coatings and agricultural products to industries and consumers worldwide. DuPont's products have a vast array of applications and are used by a wide range of industries, including farming, construction, transportation, packaging, paper & pulp and consumer electronics. DuPont competes with companies such as Monsanto (MON) in the agricultural products segment, as well chemical companies like Dow Chemicals (DOW), 3M (MMM) and BASF (BAS). We recently launched coverage on DuPont with a $58.10 price estimate for the company's stock, which is a 6% premium over its current market price. DuPont is well positioned to gain in the agricultural and specialty chemicals segments. The company's flagship seed brand, Pioneer, contributes over 17% of total company sales (FY 2010) and currently holds the largest market share in the U.S. corn and soybean seed market. With increased consolidation in the seed industry, Pioneer should capture an even higher market share. 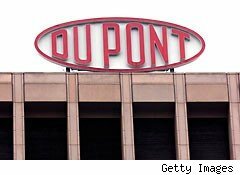 In 2010, the performance and safety materials division accounted for 49% of DuPont's global revenues and 46% of the company's gross profits. This segment accounts for 40% of our price estimate. We expect revenues and gross margins to improve going forward as the global economy recovers and consumer confidence grows. Additionally, the company is investing heavily in emerging markets such as China, which will give it another engine of growth. The performance and safety materials division has rebounded strongly in 2010 with revenue growth of about 27% vs. last year. A strong recovery in global demand helped boost sales in this division. DuPont has the potential to further leverage its existing brand portfolio, which includes names such as Teflon (coatings), Kevlar (life protection/bulletproofing) and Zytel (nylon brand). Increased investments by DuPont in Asia-Pacific should increase its market presence in these high-growth markets allowing it to capture market share. We expect gross margins to rise, primarily because of an increase in product prices in order to offset raw material costs. Developing markets, especially China, present immense growth opportunities for specialty and electronic chemicals, as well as coatings. Sales revenues in the Chinese specialty chemical market stood at $124 billion in 2008, and this figure will continue to grow. Additionally, China has in the past earmarked parts of its multibillion dollar stimulus packages for developing infrastructure, and these policies will help boost demand for construction chemicals. With DuPont increasingly investing in R&D and customer-support centers in developing nations -- for example, the DuPont Automotive Center in Shanghai -- we expect both demand and supply hubs for DuPont to shift increasingly to emerging economies.